Jungle Red Writers: Happy National Pizza Day! JENN McKINLAY: Yes, February 9th is National Pizza Day!!! Now you know what you’re doing for dinner. You’re welcome! A brief history: The invention of pizza is credited to a baker, Raffaele Esposito, in Naples, Italy in the 1880's and was brought over to the United States with the influx of Italian immigrants. Flatbreads have a longer history in Italy, but it is said that Esposito created a pizza for King Umberto I and Queen Margherita using fresh mozzerella, tomatoes, and basil, which is the same pizza margherita which enjoy today. I love pizza. I mean, I loooooooove pizza. Going to school in New Haven, it was pretty much my daily bread, as it were. Now I know lots of people are partial to their regional pizzas. Yeah, whatever. Only one pizza can be the greatest and it is hands down the white clam pie from Sally’s or Pepe’s in Wooster Square in New Haven, CT. Sorry, this is simply not up for debate. The first thing I do every trip home is to hit up Wooster Square for a pie. The first time I dragged my desert rat husband back east with me, he was indoctrinated into what real pizza (has to be brick oven) is supposed to taste like and there was no turning back. 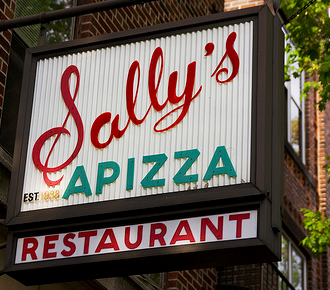 Little known fact: When I worked at Toad's Place on York St in New Haven, Friday night was Yale happy hour and we served Sally's pizza. No surprise, I always asked to work Friday nights! Clearly my fave is the brick oven, thin crust, white clam pie (did I mention it usually has bacon? ), and everything else is second rate, but I’m willing to listen to differing opinions. So let me have it, Reds, what’s on your pie? HANK PHILLIPPI RYAN: I could eat pizza every day. Every day. It is the perfect food, all cheesy and tomatoey and crusty, when the cheese greats a tiny bit brown on top? We used to make it from boxes, Chef Boy-Ar- Dee, I think? When you made the yeasty dough, and put on a can of tomato-like stuff and cheese-like stuff? We LOVED it. But now--real pizza. Street pizza, thin crust, and pungent with oregano. And the crust on the bottom all crusty (you know what I mean) with the dusting of flour still on it. with pepperoni, and extra cheese and mushrooms. And that is ALL. Yes, I've had grilled chicken, meh, and carmelized onion and potato, fine, and prosciutto with basil, all good. Pizza from other lands--taco pizza?--no. Ham and pineapple? Don't even go there. I say: why waste pizza on any other kind of thing but real regular pizza? And anchovies. Gah. Even if you take them off (trying not to actually touch one), the pizza keeps that gray fishy residue. As Snoopy says, bleah bleah bleah. HALLIE EPHRON: Cheese. Maybe mushrooms. But basically wonderfully oily salt cheese. And thin crust, please. I do love a good pizza. I remember my first taste of pizza at a Micelli's restaurant on La Cienega in Los Angeles... a date with the son of friends of my parents. I don't remember being impressed (by the pizza or the boy). In those days pizza wasn't everywhere. Even tacos hadn't found their way to California yet. DEBORAH CROMBIE: Thin crust, yes! I hate gooey, doughy, pizza. We do homemade pizza often. Whole wheat crust if I'm not too lazy or busy to make it. Rick only likes cheese and marinara sauce, but I usually do a base with a combination of good cheeses and some dried herbs. Unless I feel very inventive, my slices get at least sliced cherry tomatoes and fresh mushrooms, and basil if I've got it. LUCY BURDETTE: Hold the anchovies! You can have my share. New Haven has the best pizza in the US, I'm sure of it. We get either pepperoni (crispy, salty, oily) or white clam pizza. If I'm cooking at home, we like a barbecued chicken pizza with red onions and cilantro! JULIA SPENCER-FLEMING: If you're visiting Portland, ME, our top three vote-getters every year in the area papers' and magazines' "Best Of" contests are Ricettas, Portland Pie Company, and Ottos. That last features some weird and wonderful combinations, most famously their bacon and mashed potato pizza. I promise you, it's delicious. JENN: GET OUT! Totally trying that when I'm next in Maine! JULIA: I'm going to reminisce about my mother's "pizza" since we haven't touched on making it at home. She had the recipe from my Grandmother Fleming, who made it for my dad when he was a teen, and it was as authentically Italian as you might guess from a lady of French-Canadian descent cooking in central New York in the 1950s. First, you spread out pre-made biscuit dough on a baking sheet. (I seem to recall my mom alternatively using Jiffy brand mix pizza dough.) Cover the dough with a layer of canned plum tomatoes, which you slice up in the can (you can use a clean pair of scissors for this.) Use all the liquid! Shake Italian seasonings blend and garlic powder over the tomatoes, and then - for the pièce de résistance - lay slices of cheese in a grid pattern. I can't recall what my mother used, but I strongly suspect it was American Cheese Food product. Bake for the amount of time indicated on the biscuit mix box. We loved this "pizza." Loved it! It was in regular weekly rotation, because my dad was and is SUPER Catholic and we never ate meat on Fridays. What can I say? It was the late seventies. RHYS BOWEN: I remember pizza when I was a child and we vacationed in Italy. It was dough, drizzled with olive oil with a couple of olives and anchovies on top. None of the fancy toppings we get today. I am not a fan of any of the meats on pizza. I love veggie pizzas, chicken and artichoke, and thin, thin crust. More flatbread than pizza actually. And you can add anchovies for me too! Okay, Readers, what’s your go-to pizza? Or are you like one of my hooligans, who doesn’t like pizza? (Gasp!) I know it’s just shocking! Pretty sure we dropped him on his head or something. If my pizza has a thin, crispy crust, not too much sauce, lots of cheese, and lots and lots of bacon [or prosciutto], then I am a happy camper . . . . Thin crust all the way, Joan!!! Count me in as someone else who could eat pizza every day. I'm mostly vegan, so I usually make my own at home. Trader Joe's sells an awesome crust and vegan mozzarella. Then I just pile on whatever veggie and fake-meat toppings I have. Yum! Oh! I didn’t know TJ had crust - thank you! They have several. They sell raw dough in the refrigerated section, frozen circular crusts (including a cauliflower one, which is pretty good but kind of a pain to cook since you have to flip it midway through), and a new big rectangular one I've started seeing in the bakery section. That one might be my favorite. Sausage with mushrooms or pepperoni with mushrooms or salami with mushrooms - I think I like mushrooms but honestly any pizza is just one or two simple meats is just fine, I don't always need to have a vegetable on it besides the tomato sauce. We did have and sometimes still do have an adventure with pizza and my sister who can't tolerate milk. In the 70s, when we were teenagers, and would order a pizza to be delivered or picked up and say half without cheese and there was dead silence on the other end of the line. Thankfully the world has woken up to allergies and we don't seem to have that problem aa much a nymore. And I'm not too crazy about thick crust, used to be, but not anymore. I don't think I've ever been a place where they have white clam pizza but then I'm on the west coast. Maybe we have white Dungeness crab pizza ...no, that's just sacrilege. A pizza and Dungeness crab are two separate entities and definitely should be savored individually not together as a single dish. But that's just my opinion. I did forget one other Pizza that I actually make, it's went from one of my fancier cookbooks, it's called Armenian Pizza. You use ground beef or ground lamb or combination of the two , pimentos, herbs, some tomatoes, here's no cheese on it and it's on bread dough that you roll out flat, don't make it very often but it is good. Oh, that sounds delish! I love green olives on my pizza! Pizza? Yes please! I'll take just about any. A rare one I remember loving was a Taco Pizza from Godfather's Pizza in the Phoenix area. It's been over 2 decades since I had it, but I would love to have it again. NO!!!!!!!!!!!!!!! I was hoping they might still be around if I ever made it back there. I lean toward the veggie pizzas if I get one with much on it (of course, lots of cheese, too). I'm not a meat lover's pizza person at all. Maybe a little ham or pepperoni, but I really prefer a simple cheese (again, lot of cheese) and mushroom pizza and not an abundance of sauce. The local Mad Mushroom makes a good cheese and mushroom. When we got out for pizza in Evansville, IN with my daughter and her family, it's always Turoni's (on Main, not the other) where they do a great job on most any of their pizzas and have amazing cheesy bread. The crust is thin there, but I can handle thick crust, too, especially the thick end part. One item that most people don't think of for pizza is egg on top, and one of my favorite restaurants in Lexington, Ky--the Grey Goose Restaurant--has the Fried Egg pizza with the ingredients of spinach, mushrooms, red onions & bacon topped with a fried egg. I skip the bacon. When my husband was stationed at the Pentagon in D.C., the kids and I loved Uno's Pizza in Union Square. I loved Uno's because you could sit and watch the people walking through the station below you, if you were lucky enough to get a window onto the station seat. It was at Uno's where I learned just how strong a Long Island Ice Tea is when the daughter was with me once. Don't worry, she was in college. I will also have to mention my hometown pizzeria called Pasquales, where the pizza is might fine and the Stromboli sandwiches are the best on Earth. What??? Fried egg on your pizza??? I am speechless. Jenn, I love it, but then I also love fried egg on a hamburger, something I first had in Honolulu. There's also a place in Honolulu that serves fried egg on a club sandwich, and, yes, I loved that, too. Oh, that sounds so good! Love olives haven’t tried Greek ones on my pizza. Hmm. When I was in college we had a local pizza chain called McSalty's that had a to-die-for pizza called "Bear Pie." The college team was the Bears, so I suppose it was in honor of that, but it was the basic pile-everything-on kind of pizza with a whole wheat crust. Yumm-O! These days, I'm fond of a thinner crust with pepperoni, Canadian bacon, and extra cheese. There's a little mom and pop Italian restaurant in Dallas called Scalini's that does it right. But it wouldn't be a pizza experience around my house without mentioning the true pizza fan in the family. Zoe, my beautiful border collie, will glue herself to my leg and glare at all the other dogs so she can hog all the "pizza bones"--those last bites of crust that have a little sauce, a little grease, and a little cheese. If I am to believe her, pizza bones are the BEST!!!!! Pizza bones!!! Hilarious! My dog Otto lives for those! My dogs love "pizza bones" too! My dog might have to do without pizza bones, as I love them, too. Pizza! I could honestly eat it every day. Here on the Cape, there are not a lot of great pizza places, but I love Zoe's in Mashpee Commons. Thin crust, slightly greasy, gooey cheese, not too tomato-ey. My favorite toppings are linguica or sausage with mushrooms, but I'm good with just about everything except green peppers, olives or anchovies. And yes, I'm perfectly happy with Hawaiian, which is good because it's pretty much the only kind that my two children and I agree on. I like Hawaiian, too, but then again I like ALL the pizza. Dare I mention frozen pizza? I always have a couple in the freezer, for that quick meal when there's nothing else much to work with or time is short or we're just home from a weekend at the cottage. The base is thin crust with cheese and spinach, to which I add veggies, including spinach, and more cheese. When I'm out and pizza's on the menu, I fall back into the 70s and order ham & pineapple -- give me that old fashioned combo and leave the new-fangled wild flavourings to others. Unless it's goat cheese with roasted aubergine (eggplant) - that combo I'll gladly eat. And I bet anchovies would be great on it! Same here, Amanda, on having pizza in the freezer. And I also add stuff to them. Ham and pineapple? Seriously? That is so California. I also have frozen for quick meal nights and will add stuff to it. I like Naan for a pizza crust in a pinch, too, and if not in too much of a hurry, will make my own crust. My mom makes the best pizza EVER! California, eh? I've never been there (how odd to realize that, but it's true), and I'm pretty sure that I was introduced to ham 'n pineapple during my high school days mid-70s. Anyway, now I feel honour bound to explain: Restaurants tend to put green pepper and raw onion on their veggie pizzas, two tastes I dislike intensely. There is no risk of either of those flavours on h 'n p flavour, so I just go for that. It's useful to have a go-to order rather than wasting a lot of time wondering how wonderful a spectacular-sounding flavour combo might be and then being disappointed. Go with the usual and get what you expect. Know what I mean? Teenagers in the house! I always have a frozen pizza for one and frozen taquitos for the other. we have great pizza in the Boston area. Starting with Santarpio's in East Boston on the way to/from the airport. On the subject of anchovies... there are skinny little anchovies from a can which are pure salt, and there are fat/flat 'white anchovies' that come brined and packed in oil and lemon which are delicious! We had them for the first time in Italy - a revelation. I consider them finger food. Wasted on top of a pizza. Those sound fabulous, Hallie. Do you get them here? Brand? In Japan they eat (we ate) dried anchovies as drinking snacks. Crunchy, salty, delicious. Our local produce market has it in their refrigerator section alongside the dips and olives and smoked salmon. I may have to rethink the ‘chovies- good to know, Hallie! I'm looking for these, Hallie. Is there a brand? Our first pizzas were also the Chef-Boy-Ardees from a boxed mix. We loved them! Locally, Jim's Pizza is our go-to favorite. Big tables, game room for the kids (keep those quarters coming, folks! ), and your basic thin crust, half-pep-half sausage pizza. Sometimes with mushrooms and onions. When I can find a good one, I like a garlic sauce with chicken, spinach, fresh tomatoes, basil and onions. And leftovers for breakfast. Breakfast pizza is the best! After reading these posts, I'm pretty sure I've never had "real" pizza but I do have a favorite go-to-pizza that makes me happy! There's a place called Round Table Pizza here in my neighborhood. They used to be a chain but now there are just a few left. I'm a thin crust, light sauce, cheese, sausage, and black olives! Always! By the way Hallie, Micelli's is still here, complete with singing waiters and really bad parking. Yes It was Round Table in Seattle... thanks for helping me remember. Hub loves the black olives on his pizza! Round Table Pizza - still here in Northern California. I like their pepperoni flatbread with fresh basil, individual size with salad is a perfect meal. For me, less is more. When I stayed at an old palazzo apartment in Florence a few years ago, there was a restaurant on the main floor and I fell in love with Margarita pizza. Mozzarella, Tomato, Basil. So that's what I make for myself at home all the time, except I cheat and add a ton of garlic, soaked with the basil in olive oil. I use naan bread (Santosh brand works best) for the crust. Dead easy, and I can make up several at once, for a series of meals. Served with a side of red wine. Hadn't thought of trying naan for crust! Jenn! I lived in Brookfield Center CT from 1978-1981. Did we overlap? I think I was in my early teens the first time I saw a pizza parlor in Seattle. That would be circa 1960. My Amy could eat pizza every day and be happy. I on the other hand, am so tired of pizza... however when the urge to chew returns (and it will) Spinach with alfredo sauce, thick crust (otherwise I am doomed to wear it) and a sesame seeded crust brushed with Sesame oil. p.s Highly overrated pizza = shrimp pizza from No Name Pub, Big Pine Key FL. I moved to New Haven in 85 - just missed each other! Deborah! I probably eat 80% of my meals at Pizza Express when I'm in London. In LA, love the sausage pizza at Bottega Louie and the lasagna (!) pizza at Mulberry St. I am so putting that on my list when I hit the UK! Thanks for the Pizza Express photo, Jenn! Made me homesick for London, sigh. 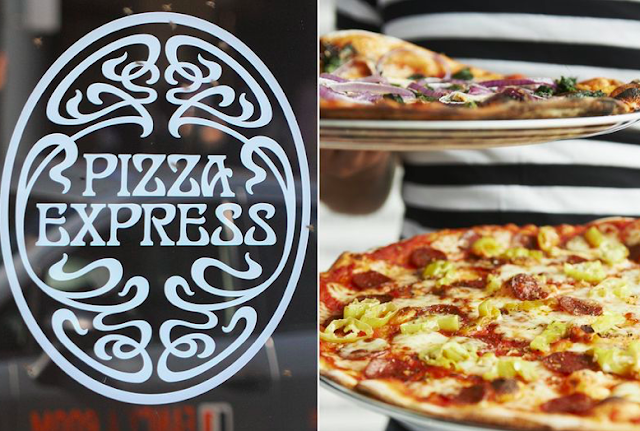 If I finally get to London, Pizza Express is on my list. Is there just one, or several? Kathy, it's a chain, so there are lots. Also in other cities. Pizza Express in Dean Street, Soho, in London, has a very famous jazz club in the basement. My favorite Pizza Express might be the one in the King's Road in Chelsea, which has a lovely patio. My go-to when I'm staying in London is usually the one in Earl's Court Road. In Hamilton, Ohio, where I grew up, there were lots of Italians, still are. I think they must have come to work in the factories that use to be there, as did so many other immigrants, including my grandfather. At any rate, we had fabulous pizza places: Isgro's was my favorite, and no pizza has ever come quite up to that standard of pie. In Cincinnati there are also lots of good pizza places, but our favorite is half-mile away. Their (fairly thin) crust is brushed with olive oil around the edges and then dusted with sesame seeds. It's fabulous, and no one else has anything close to it. The biggest local chain, which used to be our favorite, has such sweet sauce we can no longer enjoy their pie. Hank, we had that same boxed pizza at our house in the 50's and 60's. I still remember my dad slicing the pepperoni. Along with the boxed spaghetti sauce, remember that? Add browned ground beef. If I remember correctly, it even included a small package of Kraft Parmesan cheese. I was having dinner with a Canadian friend in Anaheim, 20 years ago, and we were looking at the pizza menu. She said, "Americans don't know anything about pizza. Where's the Hawaiian kind?" I just looked at her and said, "Anne, pizza is Italian." That still makes both of us laugh. Karen, ugh--that's the worst--when you bite into a slice of pizza somewhere and the sauce is too sweet. Karen, you didn't give the NAME of your Cincinnati favorite! My son lives in Cinci, so we are there often. Would love to hear your recommendation! Thanks for a great post! I am collecting names of wonderful pizza places to visit. 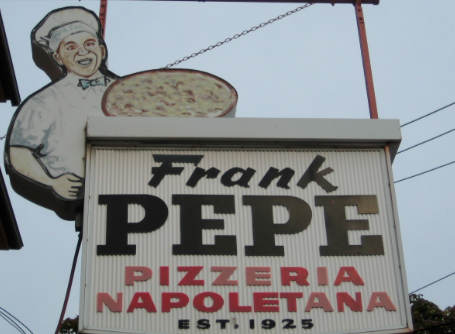 When I visit New Haven or Portland, I would love to try these pizza places. In the East Bay, there are three Zachary's Chicago Pizza. It is always so good! It is employee owned, which means that everyone who works there has part ownership in the business. This is unusual. Trying to remember which pizza place I visited when I was in London. It was a while ago. When I lived in Washington, DC, they had a lunch special near work. We could get a slice of pizza with salad for less than ten dollars or was it less than five dollars? That was a while ago too. Although I love Chicago deep dish pizza, cheese does not like me. I think as long as I limit myself to one slice, I will be ok so I eat it very slowly and savor the flavors. The pizza in Chicago is the best! I remember the server giving out slices of pizza right out of the pan! It is funny because I remember not liking pizza until I was about 7 years old and I loved pizza since then. I love the veggie pizza. Julia, my problem is with the cassin in the cheese. Ironically, when I was in Europe, I never had a problem with cheese. I know people who are lactose intolerant and they take Lactaid in either Lactaid milk or pills. We have. Lou Malnati’s here and I’m hooked on their butter crust! Jenn, butter crust sounds yummy! My first pizza experience was when I went away to college, half a century or more ago. I thought maybe I'd died and gone to heaven! I think it was sausage with a ton of goopy cheese and grease dripping off my elbows. Since then my palate has become more discriminating. My go-to choices are either Pizza Margherita or mushroom. I prefer no meat at all although I'm not a vegetarian. We have a new pizza place in Rochester where you get in line and build your own, choices unlimited. It is brick oven wood fired with a paper thin crust and marvelous. I am a minimalist when it comes to pizza, with cheese, veggies and that's it. Pizza Hut was the brainchild of two Wichita State Students,brothers, during the late 50s. They had this idea that they could make pizzas and deliver them to the dorms. They borrowed $1500 from Maud Beech, one of the Beechcraft people in Wichita, and they were off an running. They sold to Pepsico a decade or so later and retired rich. I like these stories. Ann, in New England, the big college delivery brand is Dominos. My Smithie ordered so much pizza from then she knew all the delivery guys' names - and they knew hers. Ann, so interesting. I'm not vegetarian, either, but I don't like meat on my pizza, especially ground meat. My struggle is getting as many veggies as I want without making the crust soggy. So smart - pizza is a staple for college kids! This is making me so hungry! 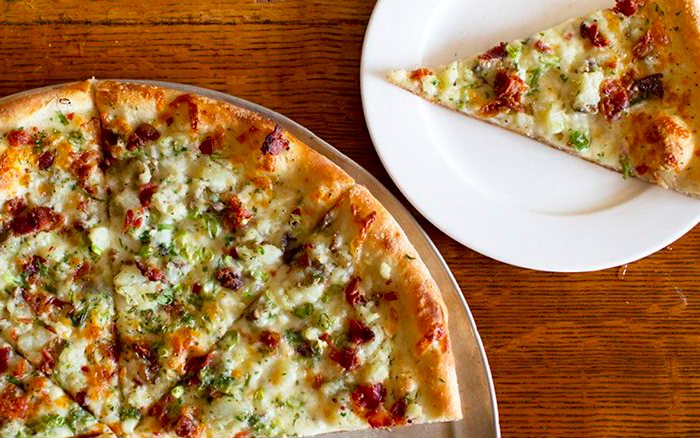 And I would say I would have to try that mashed potato and bacon pizza. That sounds so yummy! But to me that’s not pizza. That’s putting delicious stuff on a crust—and all fine. But it’s not pizza. What actually makes pizza, d’you think? Good question, Hank. I feel there’s a very personal answer for everyone but I think Hallie nailed it with the salty oily cheese. Great question Hank. IMHO it is thin crust, wood fired, and Margherita topping for authenticity. Must have 3 layered components.. crust, sauce base, protein or veggie layer covered with Hallies 'oily salty cheese" .. using uber trending cheese i.e made from yak milk, is simply ridiculous. Japanese version that includes lots of peas and lots of mayo makes me shudder. I used to make pizza on Saturday nights (including the crust), topped with cheeses and pepperoni, mushrooms and black olives. In Italy, Margarita pizza. In Cincinnati, Krimmer's Italianette Pizza. When we visit Washington DC, Greek pizza with black olives, feta cheese, and artichoke hearts. There was a tiny restaurant in Carmel, CA where we had a divine thin crust grilled zucchini and eggplant pizza. Here in Atlanta the Floataway Café does a fig and prosciutto pizza that is really wonderful too. I love pizza. Never had real pizza growing up. The school cafeteria had "pizza buns" which was some sort of red meat sauce on a hamburger bun topped with a small square of orange cheese. Not knowing any better we thought it was great. My favorite pizza now is a white broccoli mushroom one with loads of garlic. But I have to say, Jenn, I want to try that clam pie. And Julia's mashed potato - bacon one! It's one of those things that sounds odd but it delicious, Judi. Otto's also has wonderful crust - thin but chewy and washed with olive oil and four. They bake in some sort of authentic pizza over, of course. Shalom Reds and fans. We have quite a few pizza parlours in our small hamlet. One or two of them will deliver. I’ve eaten at all of them at one time or another. Apparently, it’s a good business to be in, as many of them have been here under the same ownership for decades. Some friends and I get together on Friday evenings at 7:30 pm at a new restaurant. It’s been there about 3 years now. The store is called Pizza Village but I always call it Village Pizza. (Sounds more Italian.) The owners are immigrants. We usually fill a reserved table for 14 or so. A friend of mine insists on treating me to whatever I want. They have a full lunch and dinner menu. I always just get a slice or two plain with a soft drink. If we have wait staff serving us, we usually leave a good tip, so they look forward to seeing us. Eating with others regularly is almost a lost pleasure. Now what we need is a good Chinese restaurant. Mmmmm! Chinese restaurants! I grew up around Springfield, Missouri, where a big part of the immigrant population was from Taiwan. We had tiny Chinese takeout restaurants on practically every street corner, and two or three large, fancy sit-down places. We'd go for a tub of fried rice or an eggroll the way kids here in Texas snack on tacos. I have wonderful memories of Chinese food. Thanks for the reminder! When going to restaurant, I order vegetables pizza on very thin crust but always without peppers and onions ( like Amanda, I don't like them). I also don't like meat in a pizza. What's fun with pizza is you can find them almost everywhere ( provinces, countries ) you are visiting. At home, I mostly use wholewheat pita bread as a crust, putting on it tomato sauce, vegetables at hand and a little cheese. Danielle, you're right - I think pizza is the universal food. It looks and tastes a bit different depending on where you have it, but I've eaten pizza in the UK, Germany, Italy, France and Mexico. And I love thin, crispy crust. I grew up on the west side of Stamford, where my family always got pizza from Cipri’s. It was great! I have no idea if it’s there any more. My dad worked late on Thursday nights and about once a month he would stop off at Cipri’s on the way home with pizza as a mid evening snack for us. Yum! I grew up in Middletown CT with a large Sicilian population. As a young child we always got the banquet size hamburger pizza from Marino’s. Special to our town was scaciatta, pizza crust on top and bottom usually filled with spinach or sausage and potato. Better than pizza! I love pizza, eat it once a week, at least. But, NO CLAMS! NO ANCHOVIES! Nothing from the sea. Otherwise we want the full "combo" toppings. Those pathetic things with some sauce and cheese are just the foundation. I want mushrooms, Italian sausage, pepperoni, green peppers, onion, olives. Toppings? Bring 'em on. I love pizza! But like most things, I'm picky about it. One place that I've eaten at since I was a little kid has great subs but AWFUL pizza. Then there's another place that has great pizza as long as you eat it as soon as it comes out of the oven. Otherwise, it congeals into an almost waxy like substance that you don't ever want to eat. Then there are places that I really enjoy their pizza. There is Rose & Vicki's in Marion, MA. I love their pizza a lot and when I go in to pick up a sub for dinner, I usually have a slice while I'm waiting. There's a place in Onset, MA called Marc Anthony's that had great pizza. I'm sure they still do but I haven't had any in about 5 years because I'm never on that side of town lately. I used to like Little Caesar's when I was a teenager but they went downhill. And I never liked Dominos. Oh, and just so it is known, school lunch pizza is a horror show. I don't make my own pizza and I don't buy frozen pizza. And I only like thin crust pizza. No deep dish garbage for me. And only cheese pizza will go in my stomach. I don't put any of that crap on what is already a perfect meal. Vegetables on a pizza? What a way to ruin the meal. I tried ham chunks on a pizza once and while it was "okay", it wasn't something I want to repeat. School lunch pizzas? Pizza hadn't been invented yet when I was in elementary school. Got to be better than those fish sticks though. No one has talked about how they make pizza at home. Does anyone else use a pizza stone? We've had one for years and swear by it. But in the summer when I don't want to heat my oven up to 475 degrees, I have been known to cook my pizza on the gas grill. I don't think there is much better than a Margarita pizza with a crisp crust, fresh ripe tomatoes, fresh basil, and fresh mozzarella. But my favorite pizza memory is one I had from a street stall in Florence with olive oil and artichokes. Heaven. Yes, a pizza stone makes a huge difference. I had one for a couple of years before I started using it, but now I won't make it any other way. I am an order in pizza gal. Mmmm. Sounds good Debs. I pretty much stick to basics with pizza. Pepperoni, mushrooms, lots of cheese. Or a margherita pizza. The pizza that stands out the most to me was one we had in Costa Rica years ago. We were staying in some really nice cabins within sight of one of the active volcanoes. We drove into town and ate at an open air restaurant. The owners were from Italy and they had built a pizza oven out on the patio. We had a lovely crisp thin crust pizza with goat cheese. I don't remember what else was on it but the goat cheese made it! Later that night Frank's stomach started complaining and he looked in vain for a cup or glass so he could pop an Alka Seltzer. He went outside to the 4WD truck we were touring in to find a soda can or beer can to make into a glass. The security guard out there stopped him. We didn't know anyone was guarding the cars at night! Anyway they yakked in Spanish while he secured his can, used his knife to cut off the top, and fashioned a glass to mix his magic elixir in. He still refers to that pizza in very unflattering terms although he liked it while he ate it! For our small little town, we have at least a dozen places that offer pizza. I enjoy one that is loaded with toppings and on a whole wheat crust. The cheesier the better as far as I am concerned. How did I miss this yesterday? Must be this flu. Jenn, I must disagree on Sally's and Pepe's. Modern on State St. is the one for me. The margarita is the best--well done in the front oven, please (just to prove you're a person in the know, LOL). And I have to say, my name tag at Malice two years ago was a great conversation opener at least half-a-dozen times. New Haven? someone would say, looking at my tag. Oh! The pizza! And off on a conversation. This was even an opener for a brief chat with Charles Todd, someone I would have been to shy to speak with on my own! But, he's a Yalie, so we could talk pie.